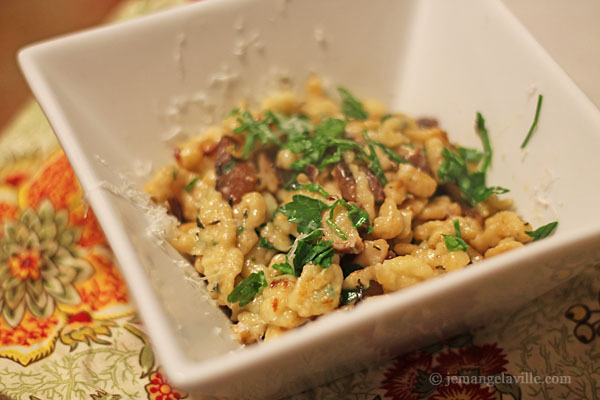 This week’s French Fridays with Dorie recipe is Herb-speckled Spaetzle and it is on epicurious, so even if you don’t have the cookbook, you can still make the recipe. This was very good. I actually just tried making spaetzle a few weeks ago using a different recipe (buckwheat spaetzel) and while that was good, this was great. I used a colander for making the spaetzle both times, but I wish I had a flat grater, that idea sounds intriguing and a bit easier.